For the last two years, my local YMCA has had a month-long indoor Ironman competition. You have a month to do an Ironman, but the faster you finish, the better the prize you can choose. Last year, I did it in 8 days. 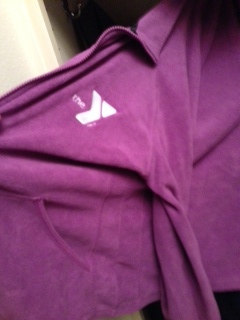 I got a purple fleece that says YMCA on it. I road 112 miles in 3 days. I swam 2 miles in 2 days. And then I got sick. And as I was walking 2 miles while blowing my nose and coughing, I realized I didn’t really need another fleece and that what I really needed was to lie down and take a nap. So I did. And the second week passed by along with my choice of an incredibly fashionable YMCA fleece. I finished in three weeks so now I’ll just end up with a hoodie that says YMCA. I’m unsure if I’ll wear that hoodie with pride or if I’ll be bitter when I look at it and think, “If only I’d gotten the flu shot.” Hard to tell. I think, instead, I’m going to turn it into a different goal. I’m gonna see how much purple YMCA clothing I can collect and whenever I wear it, I’m gonna dedicate my workout to Prince.